The 2018 NFL Draft Prospect series breaks down draft-eligible players, highlighting their college production as well as their NFL potential. 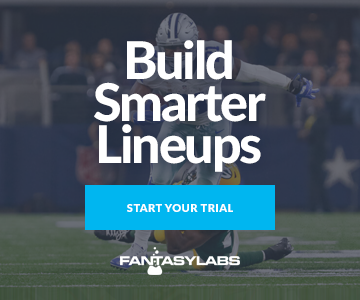 Daily fantasy players should know about NFL rookies before they’ve played a down of professional football because they are among the most misvalued assets in all of DFS. People who know NFL rookies have a significant DFS edge. The draft will be held at AT&T Stadium in Arlington, TX, from April 26-28. This piece is on North Carolina State running back Jaylen Samuels. For more on all the other backs in the class, see our 2018 NFL draft running back rankings. Updated as of Mar. 4. When he practiced and played at the Senior Bowl, Samuels did so as a running back — and he unsurprisingly ethered linebackers in pass coverage — so we’re grouping him with the backs even though he worked out with the tight ends at the NFL combine. Given his physical profile — specifically his size, speed, and agility — he’s not going to be a professional tight end: He is, however, likely to be drafted no later than the fourth round regardless of how his team ultimately decides to use him. A hybrid player, Samuels regularly moved across the formation at NC State and served a variety of functions: Tight end, slot receiver, fullback, H-back, goal-line back, and sometimes even wideout. He did it all. A versatile prospect, Samuels is in the mold of Kyle Juszczyk, Charles Clay, and Aaron Hernandez as a high-level multidimensional contributor, except he’s built like a lead back and was a more prolific college producer (2,719 yards and 45 touchdowns from scrimmage over his three final years). A backup as a freshman, Samuels broke out as a sophomore in 2015, serving as the No. 1 receiver for quarterback Jacoby Brissett and leading the Wolfpack with 65 receptions, 597 yards, and seven touchdowns. In the two seasons after that he continued to produce, catching 123 passes for 1,112 yards and 11 touchdowns. On top of that he was a highly effective and efficient ball carrier throughout his career, rushing for 1,107 yards and 28 touchdowns on a robust 6.1 yards per attempt. As a senior, he culminated his career with a clean 1,000-yard, 16-touchdown campaign on 75 receptions and 78 carries.